Safest way to spray wasp killer spray from a 24ft extension pole. Get rid of wasps hornets. We carry a full line of high-quality extension poles. All of our poles are manufactured to the highest standards for superior quality, rigidity, and strength. 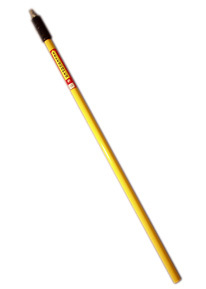 * A quality, heavy-duty extension pole. * Constructed from a combination smooth composite fiberglass handle and aluminum tube for balance. * Die cast metal 3/4" (2 cm) threaded end. * Heavy-duty chuck and collet locking device. * A three section pole that extends from 8.25ft-23.25ft. 1-1/4" (3.2 cm) and 1" (2.5 cm) Fiberglass Handles, 7/8" (2.2 cm) Aluminum Tube. * Extension poles have standard American threaded tip.